The Wrist Restrictor is an easy-to-use training aid that can be worn to restrict or enhance wrist rotation during the bowling release. Topping the ball, or over-rotating, at the point of release drastically affects the movement of the ball down lane. The Wrist Restrictor will help sync wrist and elbow through the release to correct over rotation. A backup ball release is a clockwise (RH) or counter clockwise (LH) rotation of the wrist which is opposite of a traditional hook. 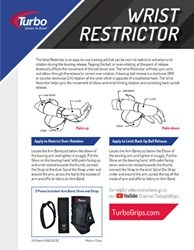 The Wrist Restrictor helps sync the movement of elbow and wrist limiting rotation and correcting back up ball release. 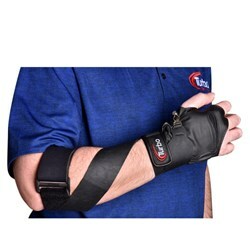 Product includes 3 pcs: Glove, Forearm Band and Strap. Made my Average Go up. I am a twice a week bowler. Average is 125. Many coaches have tried to rid me of my Backup Ball. Nothing has worked so I just struggled with it. My husband got me this device and I instantly began to throw a gentle Right to Left arcing Hook ball. I shot 145/ 152/ 148. I bowled one more game without the Wrist Restrictor and the backup ball returned. The device seems to give me a gentle tug in the correct direction, CCW. I am never bowling league with out it. This is no gimmick, it works. This can be used for either left or right hand. 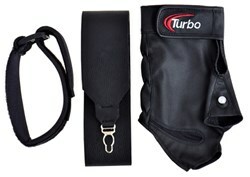 Is there a size chart for the turbo wrist restrictor? Unfortunately, Turbo did not provide us with a sizing chart. Will it help keep my elbow inside the ball? The Wrist Restrictor helps sync the movement of elbow and wrist limiting rotation and correcting back up ball release. Am left handed and getting some pain in my left wrist, arthritis. Probably from rotation. Would something like this help? Ave 180. Need something firm. Yes, this would help out for your arthritis or any wrist support would help. 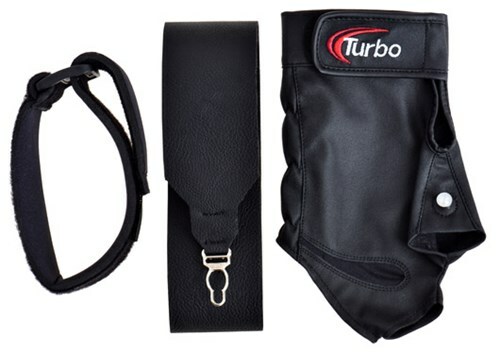 Due to the time it takes to produce the Turbo Wrist Restrictor ball it will ship in immediately. We cannot ship this ball outside the United States.